Do you need a modular office building in your warehouse or manufacturing environment? Sometimes you need an office in order to complete the paperwork, filing, and other small details that require the use of an office. A office space in a manufacturing or warehouse environment also provides a safe place for your employees to get this work done without dealing with the loud noises of the warehouse. Panel Built is here to help you get what you need and your employees need. Our modular office buildings are engineered for flexibility, ease of durability, installation, and design. The offices designed by Panel Built provide a quiet, safe inplant office for visitors and staff. When you need the space to help out your staff to do their job. Panel Built has the modular building solution just right for you. Do you also need help to plan out your modular office system? No problem, we have word class engineering and customer service that stands behind each of our modular office installations. We are more than happy to help you out and to plan the office system you need. A modular office system has many benefits not just for you, but staff and visitors too. It’s the perfect solution to keeping your employees comfortable when they’re in a manufacturing or warehouse environment. The office system provides a temperature controlled, clean, and well lit space for your employees to work at when they need to get office work done. It also gives visitors a safe and quiet place to relax if they’re visiting the warehouse or manufacturing environment. Do you want to get the most out of your modular office space? We recommend for the most efficient use of space to place your modular office on a mezzanine. A mezzanine will give your staff a bird’s eye view of the entire facility and give them an extra level of safety. 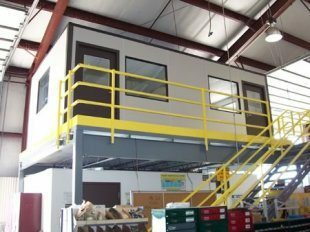 Mezzanines are perfect for equipment enclosures, offices, clean rooms, break rooms, observation towers, and much more. You get so much out of it! And it truly does make the best use of space as well. At Panel Built our modular offices have a unique connection system for easy and fast installation. This is due to our polystyrene core. It’s an economical, light weight panel with a r-value. Our polystyrene panels are a powder coated binder post system that provides a stable, sturdy connections. This in turn becomes a raceway of sorts for date, electrical, and phone connections. There is a variety of custom surfaces to choose from to fit what you need. There are also insulated windows and modular tall wall capability to make sure the office environment stays safe and secure. You can also pick the panels you want for your modular office. PBI is known for our versatility in allowing you to choose the wall panel designs and finishes. Our modular walls can be expanded into with the polystyrene. We also offer a one hour fire rated core safety barrier made out of mineral wool and steel studs for extra safety. The panel joints can also be utilized for our exclusive 1” wide vinyl divider strip or use a conventional aluminum extruded binder post. The surfaces we have and you can choose from are limitless. There is our popular 1/2” vinyl covered drywall. It’s excellent for cost, sound, and fire safety. At PBI we also make use of plywood, aluminum, porcelainized steel, steel, fiberglass reinforced plastic, and hardboard. We virtually use any type of surface imaginable that you can laminate. Our systems are built around convenience and being highly versatile. We are always haply to supply customers with a standard “of the wall” 8′ x 10′ structure. 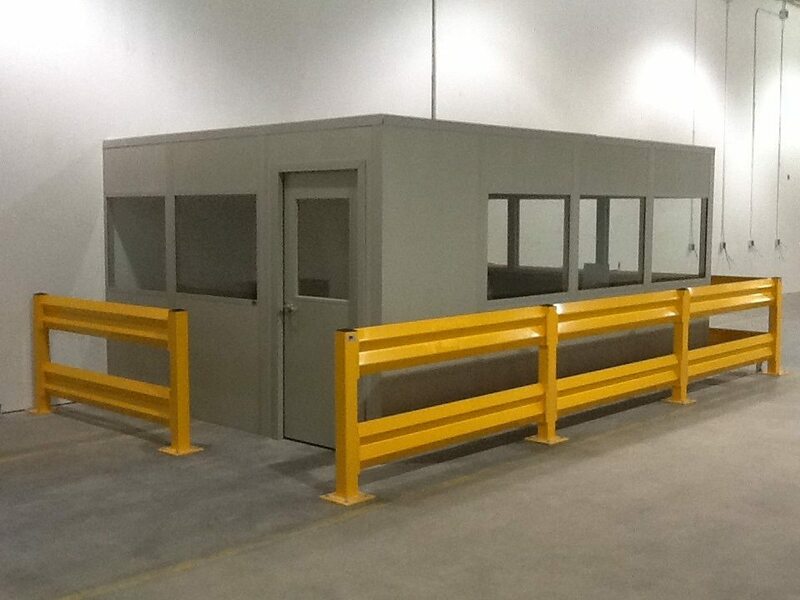 We also have the capabilities to make any size structure you require within a 1/4” tolerance. So you never have to worry about not having the perfect modular office in the work environment. Just let us know what you need and PBI will handle the rest! Why would you want a mezzanine to go along with your modular office? Well, they are heavy duty industrial platforms that go hand in hand with supervisory inplant offices. They can also be used as vision towers, metal range towers, and much more. Mezzanines provide a bird’s eye view of plant work areas and is able to convert wasted vertical space into a productive work environment. PBI mezzanine can go as high as two stories. They are just as tough as they are rugged looking. They also support up to two story construction and can even meet military specs MIL-B-28658D. Mezzanines are also built to handle and accommodate just about any space requirement. Here at PBI we care about you as a customer. We understand good human relations with our customers and staff is the foundation of a company’s success. We care about our customers and about the quality of the buildings we provide for you. Here at PBI we make the process as easy as we can for you. Our buildings are all pre-fabricated at our factory to make installation fast and easy.